This 22 LR cartridge from ELEY’s Target line of ammunition sports a 40 grain projectile. 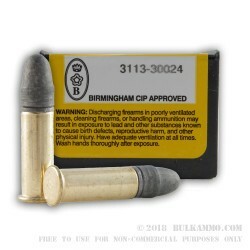 The bullet’s round nose makes it extremely accurate at close to medium ranges, and also lets it penetrate targets well in addition to delivering superior energy upon impact. ELEY is the 22 LR specialist -- it is the only ammunition they make, save for air pellets. The British company was founded by the brothers Eley in 1928, and they’ve pretty much perfected their manufacturing processes over the better part of the past 200 years. For that reason ELEY’s ammunition is favored by competitive shooters the world over. 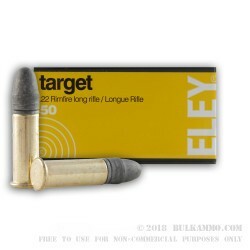 ELEY’s Target line is essentially their basic cartridge, although that in no way reflects poorly on this round’s high quality brass casing, responsive rimfire primer, and even-burning propellant.